Home Skin Care How To Make Body Butter At Home? How To Make Body Butter At Home? How To Make Body Butter At Home? Skin being the biggest organ of the body needs extensive care due to extreme wear and tear. As we age, the skin texture and radiance withers away causing spots, blemishes, fine lines and wrinkles. There are many moisturizing creams and butters that help in increasing the skin elasticity and keeping them looking young and healthy. One among them is the body butter that is loaded with nutrients and moisturize the skin from within. Body butter is made from a number of natural components including fruits, vegetables and leaves and is healthy for the skin. The oils from these ingredients is cold pressed and mixed with various fatty acids to give thicker consistency in the cream form. Since it is natural oil of the fruits and vegetables, it is very easily absorbed by the skin and aids in providing hydration to the body for a longer duration. Body butter is rich in various minerals like vitamins, proteins, magnesium, iron and contains antioxidants to fight off free radicals and promote a healthy growth of skin cells. Body butter has various benefits for the skin that includes moisturizing not only from the outside but inside as well. It also forms a protective layer outside the skin that helps in locking the moisture and keeping it hydrated. Since it does not let the skin dry, body butter reduces the chances of premature skin ageing, stretch marks and wrinkles. Body butter is also come handy in reduction of inflammation caused by pimples and acne. There are many kinds of DIY body butters that one can churn out using easy, simple and seasonal ingredients from the kitchen. So, if you are wondering how to make body butter at home, just follow these straightforward and uncomplicated steps and create your own awesome natural, side-effects free and inexpensive remedies. Coconut is the best ingredient for skin care. Not only it moisturizes but also helps keep away the free radicals and harmful toxins from the surface of the skin. Coconut also aids in combating the risk of bacterial and fungal infections. This homemade body butter remedy is simple and easy to prepare and can be stored for up to a month. This is a very decadent body butter and instantly gives you baby soft skin. Both chocolate and mint are known for their moistening and healing properties and with the application of this body butter remedy, any problem you are facing with regards to dry and flaky skin, will be addressed effectively. This body butter works best for dry skin in winter season. This cocoa body butter lotion smells awesome and works perfectly well for dry skin. It not only moisturizes the skin but the cocoa powder in it will help in keeping infection causing bacteria and germs away. Regular application of this cocoa body butter will also ensure making your skin glow with natural radiance. Due to its running consistency, make sure to pour into a bottle and store in a dry place. Avocado has natural nourishing and moisturizing properties and applying it on the skin in any form is only going to enhance the texture and quality of the skin. Needless to say, this body butter recipe is the easiest yet most effective when it comes to moisturizing skin for longer period. For those who remain out for work for longer hours can use it daily as it keep skin soft for more than 10-12 hours. Well, if you are thinking on how to make body butter at home using coconut and rose water, just simply follow these steps. Rose water, apart from its marvelous fragrance also helps in keeping the skin soft and smooth. It is a great natural toner that keeps impurities at bay and also makes the skin glow naturally. This delicious mango and cocoa body butter smells so godly that you would want to eat it. After all it makes use of two of the most delectable ingredients you can think of. You can easily churn out this totally amazing body butter at home by following the step-by-step guide given below. Rest assured, your skin problems and woes will vanish easily and you’d be left with absolutely baby-soft and smooth skin. 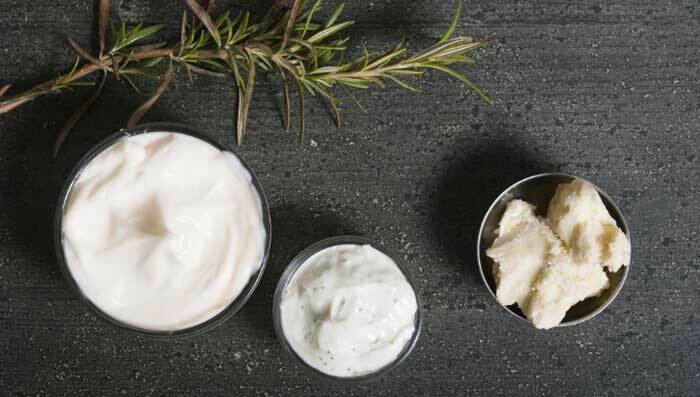 These body butters are amazing for skin and are also very quick and easy to make at home. Because they make use of natural ingredients, they are safe, inexpensive and come without any side effects.